This post is part story, part tutorial, part one of a short series. It is my first real post on Medium, and I am going to try something a little different. Instead of a how-to on installing a TensorFlow stack, I am going to write about problem-solving, which developers often call “debugging.” By the end of my story, I hope you — the new developer — will feel more confident about installing a TensorFlow stack, even if some of the requirements change and even if you use a different stack. Yup. You can do this. Why debugging? To me, the process of debugging used to be this abstract realm of wonder until I found myself just doing it as part of the process of my work. My debugging experience with Python 3 and TensorFlow while testing my first TensorFlow build feels like a smaller deal than I would have thought when I first started programming. Some of that is the problem-solving experience I now have in programming, but I hope describing the process will bring some perspective to new developers working with emerging software and stacks. Now, in a world where most TensorFlow users are on Python 2.7, and Python has officially stopped supporting it, I hope this story-tutorial will make it less confusing to get started, even as the software is dynamic and transitioning. The transition is always with us. That’s just tech. Some of you may have already installed some of or all of this software. In the process of digesting this story, perhaps debugging will become familiar enough to you that you can fill in what’s missing in the tutorials you find for this and other projects. Install Hombrew with directions from this page. Bug Number One: Did you notice how I just breezed by that instruction? Well actually, it took several steps to figure out that I should specify Python 3.4. I had already brew installed Python 3, which updated me to 3.6, but a few steps after the first two times I tried to install TensorFlow, I received all kinds of error messages. There was a bug. When I saw that there was a fix to that problem (thanks, Google!, I decided to focus on Python 3.4 for this installation. So there are few things you need to know: Easy_install is a package manager (like Homebrew), but your Mac might not let you make that change unless you type “sudo” in front of the command. This is not a bug. It is a problem-solving opportunity related to the fact that I was using Python 3. I knew that pip3 existed, so my instinct was to use that. I tried it. It failed. I used sudo easy_install pip, and it worked. Side note: LEARN ABOUT SUDO! It’s a very powerful command that overrides your computer’s default protective behaviors. Install virtualenv, which is something like a walled-off operating system. It is inside your computer but segregated from the rest of your machine. I typed “sudo pip3 install --upgrade virtualenv” in the terminal. It worked. After that, all I had to do was build the virtual machine by typing the commands (borrowed from TensorFlow’s documentation page) in the first line of next screenshot. The list of installations is longer, but I think you get the idea. I was happy to see that there was an actual upgrade for Python3 and documentation for reference. If that worked for you, you’re almost done installing! The story will continue with iPython/Jupyter Notebook, Scikit Learn, matplotlib, and Numpy. The first part of this series focuses on installing TensorFlow and a few dependencies on a Mac operating system, but the following are also useful resources if you are getting started in A.I. on different systems. Special thanks to Accel.ai — a career accelerator shaping the next generation of A.I. professionals and enthusiasts — for assembling this list. 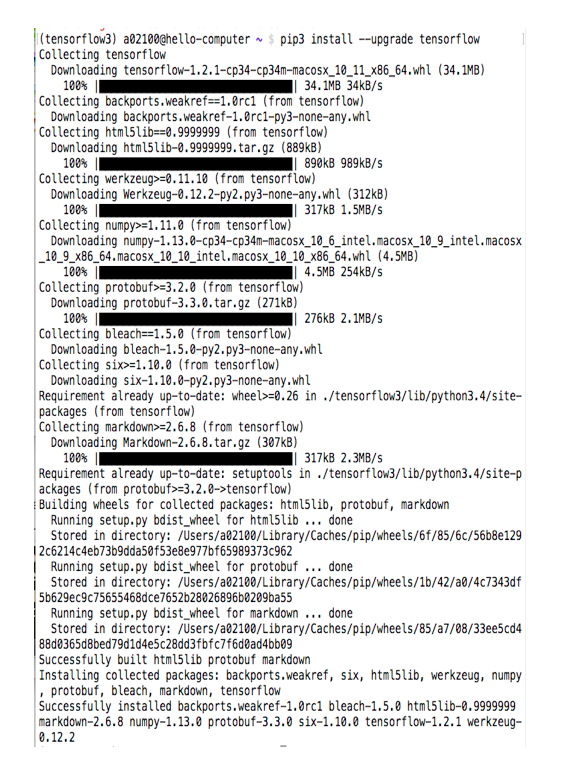 Installing TensorFlow — TensorFlow is supported by Mac and Linux, but not Windows. You can use their Docker distribution on Windows if you wanted.